Awesome! I have to have it! Ukulele players already are seen by civilians with a jaundiced eye, at best. (See one of the items Woodshed posted on 10/16/09, Ukulele Hunt, to confirm this image, if any confirmation is needed.) Not all of us are quite as quirky as the group presented in Rock That Uke, but we're seen that way. I suggested the term "Ukies" to Humbleuker Jeff (please help him in his search for ukuleles in movies) for those ukulele players who've crossed a line, ala Star Trek fans who've become Trekkies. 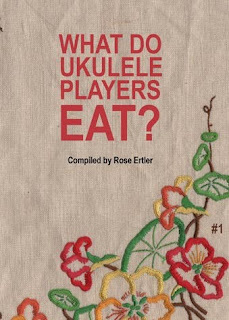 Presenting to the world a cookbook that declares that uke players are vegetarians/vegans, only confirms the image, & I can testify personally that not all ukulele players are of the non-meat-eating persuasion. Deliciously rich chocolate chip ice cream rolled in crisp flakes, lightly deep fried. Topped with authentic chocolate sauce & whipped cream. The Rhythm Club All Stars are playing the Cicada Club tonight(Sun. 10/18), broadcast live 8pm Pacific Time, clubcicada.com. No ukuleles, but lots (averaging 2 hours) of good vintage jazz/dance music, including (for string-instrument fans) the amazing John Reynolds on his shiny National resonator guitar & banjo. The show will be available for viewing next week in the Broadcast Archive, also. But watch John, if you can. I thought Ukers have Banjo players for breakfast! !